AMD has been stealing the graphics card show for nearly a whole month now but today Nvidia is finally striking back with its "The Way It's Meant to be Played" event in Montreal, Canada. Day one of the two-day event kicked off with Nvidia announcing Gamestream, a new service that pairs the power of its GPUs and the Nvidia Shield to stream games directly on to your HDTV. It's basically just some new branding to say the Shield's streaming tech is coming out of beta and will arrive to Shield owners for free starting on October 28. The underlying tech is still the same though. 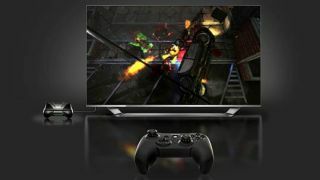 Your souped up Nvidia GPU pushes game streaming to your Nvidia Shield, which you then connect directly to your living room screen via HDMI. After you've setup the Shield to your massive entertainment system, you can grab a Nyko PlayPad Pro or other Bluetooth controller and then actually sit down to play. It's a lot of steps, we know. The service promises to deliver hitch-less and lag-free 60 frames-per-second gaming for over 50 PC titles - including some upcoming releases this fall like Batman: Arkham Origins and Assassin's Creed IV: Black Flag. The Nvidia GeForce GTX Titan is still burning the wallets of many PC enthusiasts, and for those who don't have quite as much cash to burn, Nvidia has announced the GeForce GTX 780 Ti. If you're unfamiliar with the Nvidia Ti nomenclature, Ti cards are essentially a slight bump up from the regular 780, landing it somewhere between there and the highest benchmarking Titan. Nvidia wasn't keen on revealing any specs just yet, and stuck to hinting that its release is in mid-November. But you can bet it's going to give AMD's R9 290 and 290X video cards a run for their money. As GPUs push the envelope on graphical power, most screens can't keep up, which leads to tearing images, stuttering, V-Sync input lag and a number of other issues. To help alleviate this problem Nvidia is introducing a new G-Sync module to gaming monitors. Nvidia claims this new device will reduce all of these visual issues by synchronizing your monitor's refresh rate with the GPU's rate, making objects appear sharper and smoother, allowing for tear-free gameplay. Instead of having the GPU attune itself to a slower monitor, the device is forcing the monitor to sync, which could free up the GPU to focus on making explosions even more spectacular among other things. But before you get all hot and bothered over this, it's a module that can't be added to your existing screen. Rather, Nvidia is partnering directly with manufactures including ASUS, BenQ, Philips and ViewSonic to release G-Sync equipped monitors starting next year. Not to be shown up by the next gen consoles' ability to record gameplay, Nvidia also revealed a built in game capture tool called ShadowPlay. On October 28 this new feature, along with the GeForce Experience 1.7, Nvidia's driver upgrade and GPU optimizing software combo, will update to many of its GeForce GTX 600 and 700 series GPUs. Nvidia says ShadowPlay will be a free and fast way to automatically capture gameplay of those epic Battlefield 4 moments by saving up to 20 minutes of high-quality 1920×1080 footage to a temporary file. Hitting a user-defined keystroke will save the MP4 footage for editing and sharing later on. Alternatively, you could switch ShadowPlay to manual mode, which allows you to record your entire play session to disc. Supposedly it can do all of this without impacting your GPUs performance, but it seems doubtful since its recording gameplay while doing all the regular graphics card work simultaneously. Nvidia says down the line it will have another update that will let you stream your games directly to Twitch. And in case you don't own an Nvidia graphics card to get any of these features, the GPU company is rolling out a new line of GeForce GTX Holiday Bundles. Gamers who purchase a GeForce GTX 660, 670, 680, 690, or 760 from October 28th until November 26 from a participating US store (digital or brick-and-mortar) will receive codes for Assassin's Creed IV: Black Flag and Splinter Cell Blacklist and a $50 off coupon for an Nvidia Shield. If you're in the market for something with more oomph, buying a GTX 770, 780, or Titan will receive the same games plus Batman: Arkham Origins and $100 off of an Nvidia Shield. Interested in Nvidia? Check out our Oculus Rift review for a taste of virtual reality!